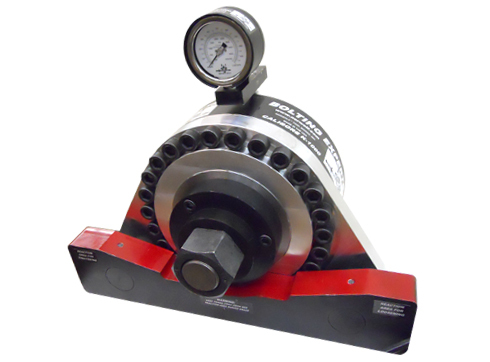 The Calibore™ bolt tension calibrator for all bolts using the following tools: Impact Wrench, Manual Torque Wrench, Nut-runner, Pneumatic Torque Wrench, Hydraulic Bolt Tensioner, Hydraulic Torque Wrench, Torque Multiplier, Missing Link™, DTI Squirters and TC break-off bolts. • “Snap–in” front plate and hex bushing. • Built in adjustable reaction bar. • Gauge reads in both pounds and kilo Newton’s. 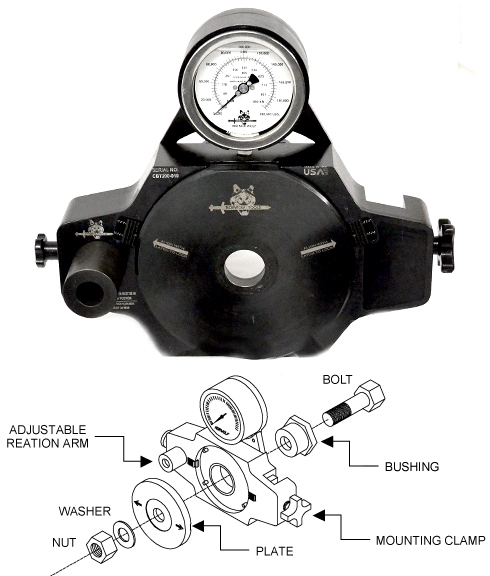 • Solid, heavy-duty gauge protector. • Solid milled clamp that secures at two points for beam mounting. • Drilled holes provided for base / table mounting. • Label identifying recommended minimum bolt tension. • Fitted, wheeled carrying case. • Light weight (basic unit weights 17 ½ lbs. compared to competitions 45 lbs.). • Available in 350 K and 1,000 K.